The Unknown Cook loves barbecue any way we can get it. If it’s Barbecue Ribs, we are there. If it’s pulled Barbecue Pork, we are there too! 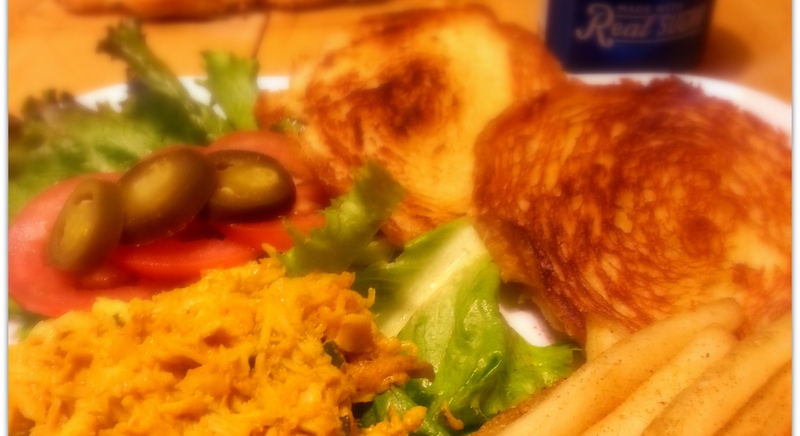 Because of our love for barbecue, we decided to do our best Pulled Barbecue Chicken Sandwich. We have found this recipe to be a favorite for quick, inexpensive meals. It is also pretty easy to make. Get ready to make something awesome for your family and friends to enjoy. 1. Through trial and error, we have found that cooking your chicken in a crock pot is especially effective when it comes to flavor and for shredding it. The downside to this method is that depending on the size of your chicken, it can take up to 7 hours to cook. Make sure you have this kind of time to spare before serving time. 2. After the chicken is done, remove it from the crock pot and allow it to rest for 20 minutes or so on a cutting board. After it has rested, take a dinner fork and begin to pull the meat from the bones. When all meat has been removed, you should now take a second dinner fork and begin shredding the chicken. This process is fairly simple by placing the two forks in the center of a piece of meat and moving the forks in opposite directions. 3. Once all your chicken has been shredded, add your diced onions and Cattleman’s Gold Tangy BBQ sauce to the chicken. Mix it thoroughly. How much sauce to add is your preference. Some like a really moist sauce mixture. Other’s prefer it to be just enough to flavor the chicken. After you have mixed it thoroughly, cover your pan with aluminum foil and place in oven at 350 degrees for around 20 minutes. to melt spreading it evenly over the surface. Once it has melted, place your sliced rolls on the surface and allow them to grill at your preference of darkness. The ones pictured are perfect for us. You may like yours a little lighter. 5. 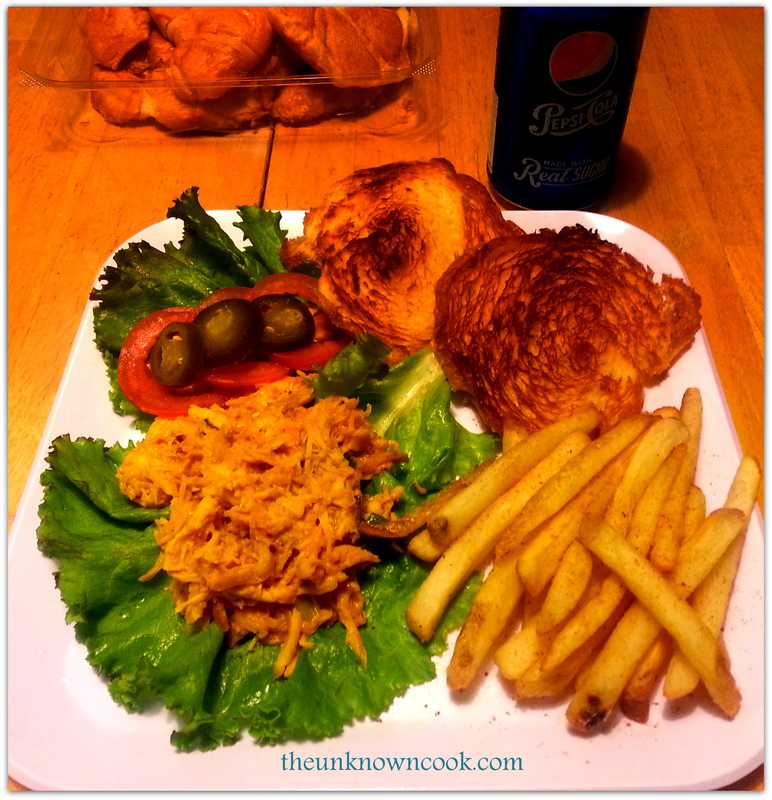 When the 20 minutes has expired on your pulled barbecue chicken, take it from the oven and remove the aluminum foil. Your onions should be just at transparency and you are ready to serve your sandwiches. 6. Add lettuce, tomato, and whatever other fixings you’d like. Seasoned fries also go well with this! If you don’t have a lot of time to spare, purchasing an already cooked rotisserie chicken from your local grocer will cut out the entire time it takes to cook a chicken in the crock pot. Do keep in mind, however, that a rotisserie chicken is already seasoned. That isn’t necessarily a bad thing if you don’t mind that flavor being a part of your barbecue. If mustard based sauces aren’t your thing, substitute with a bottle of your favorite or add your own home made sauce. Either way, you are going to enjoy this easy to make, time saving meal! Posted on October 21, 2014, in Uncategorized and tagged barbecue chicken, barbecue ribs, bbq chicken, bbq pork, bbq ribs, best bbq chicken, best bbq chicken sandwich, how to barbecue chicken, how to shred chicken, pulled barbecue chicken, pulled bbq chicken, pulled bbq pork sandwich, pulled pork, shredded bbq chicken. Bookmark the permalink. Leave a comment.